The mid-rise (7-story) Hill and Olympic Project is situated along the commercial corridors of Hill Street and Olympic Boulevard in the South Park community of downtown Los Angeles. Craig Lawson & Co., LLC prepared and processed the entitlements to allow 263 residential units above 14,000 square feet of ground floor retail. Residential amenities include a swimming pool, screening room, gymnasium, sun deck and courtyards. 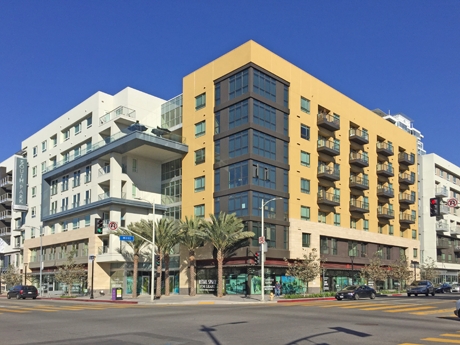 This project, completed in 2015, is one of three similar projects developed in the South Park area with a total of over 800 new residential units and 42,000 square feet of retail space. CLC prepared and processed the entitlements for all three projects, including environmental clearance, Site Plan Review and Conditional Use Permits for the sale of alcoholic beverages.